No manual except instructions on the inlay ? This one is very strange. 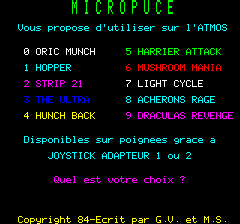 The program allows to run on Atmos games designed for Oric-1 only. But if you look at the instructions and at the tape labels, side 1 is supposed to hold an Oric-1 version! What would it be used for? Actually, both sides are strictly the same program, for Atmos only. 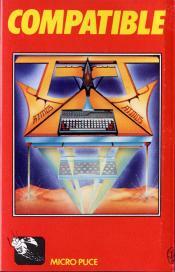 I have left the 2 programs for anyone willing to check [comp_o.tap] for "Oric-1" (!) and [comp_a.tap] for Atmos. (Jean did the transfer on his side, and his versions are the similar, too). Both my version and Jean's version had no manual. 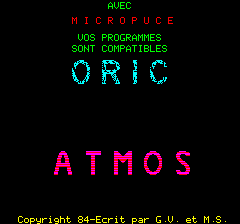 Very usefull in order to play some Oric-1 titles on your Atmos. The program is compatible with the programs "Joystick adapter" 1 and 2 that permit to play those games with a joystick. A must have for Atmos owner willing to play hunchback !